NEW ORLEANS -- After trailing for most of the first half against a shorthanded Pelicans team, the Trail Blazers pulled away after the intermission, outscoring New Orleans 66-53 in the second half to pull away for a 122-110 victory in front of an announced crowd of 16,117 Friday night at Smoothie King Center. "That was a really tough game. New Orleans played at a very fast pace, Julius Randle was outstanding," said Trail Blazers head coach Terry Stotts. 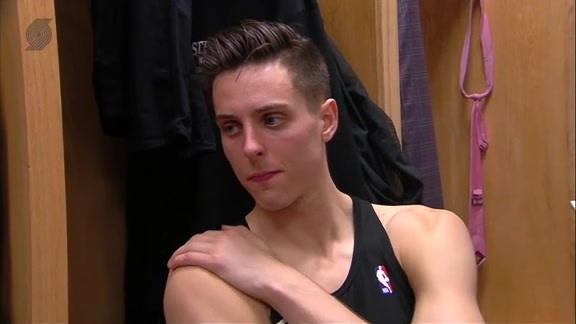 "For us, Zach (Collins) came of the bench and did a nice job defensively, Rodney (Hood) made some bigs plays down at the end that were important. It was a good win for us." Portland is now 42-26 overall, 17-17 on the road this season and have swept the season series with the Pelicans 3-0. 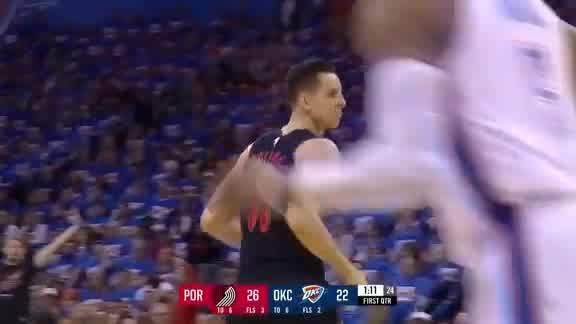 The Trail Blazers have won three straight and remain in fourth-place in the Western Conference standings, trailing the Rockets by a half game while leading the Thunder by the same margin. Despite playing without Anthony Davis, Jrue Holiday, E'Twaun Moore and a host of others, the Pelicans, and more specifically, Julius Randle, took control of Friday's contest early. New Orleans shot a blistering 74 percent from the field in the first quarter behind 21 points on 9-of-12 shooting from the field and 3-of-4 shooting from three from Randle. "(Randle) was very aggressive going to the basket," said Stotts. "We put length on him -- Chief has length, so does Nurk, so does Zach -- he just had an outstanding game. He was good going to the basket, he kind of has an uncanny shot where he's going right and still can get back to his left, he draws fouls. He's a unique player." But improved defense, especially from Collins and Enes Kanter, and Randle was held scoreless in the second quarter, allowed the Trail Blazers to cut New Orleans' lead to 57-56 by the halftime intermission. From there, it was simply a matter of playing just a bit better on both ends for the Blazers. Between going 19-of-20 from the free throw line, 7-of-17 from three and outrebounding the Pelicans 20-12 in the second half, the Trail Blazers were able to push their lead to 12 points after a Rodney Hood three with just under four minutes to play in regulation. 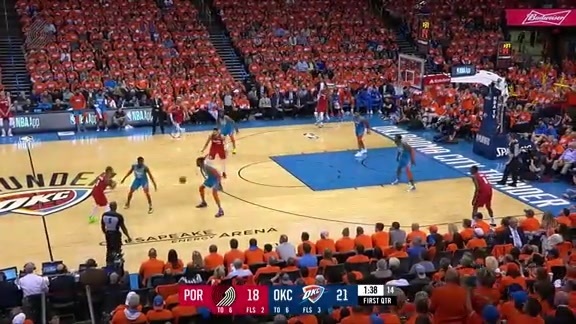 New Orleans would get he lead down to eight with just over a minute to play, though they would get no closer before Portland push the lead back up to 12 by the final buzzer. "They just kind of came out on fire," said Lillard. "They were moving fast, their pace was up from the start and we didn't react well to it. So you see what kind of game it was before we adjusted." The Trail Blazers were led by Lillard, who went 8-of-18 from the field, 4-of-9 from three and 4-of-4 from the free throw line for 24 points to go with seven assists and four rebounds in 35 minutes. With his third point Friday night, Lillard moved into second in franchise history in scoring, moving past LaMarcus Aldridge and trailing only Clyde Drexler. “To move up the list with such a great organization, so many great players that came before me and to move up again is an honor," said Lillard. "One more person to go." 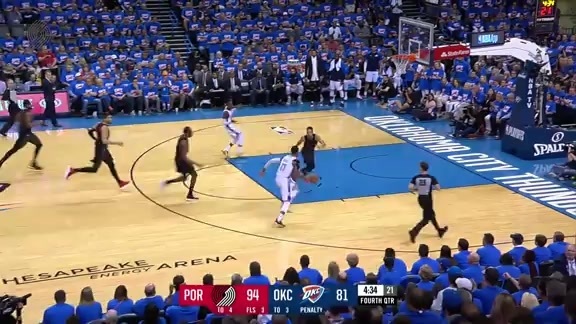 CJ McCollum shot 50 percent from the field and 3-of-4 from three to finish with 23 points while also logging five rebounds, four assists and a block in 38 minutes. Hood, starting in place of Moe Harkless, who sat out with left knee soreness, went 5-of-7 from the field for 17 points in 28 minutes. Kanter missed just one shot from the field and one from the free throw line to finished with 17 points, eight rebonds and two assists in 20 minutes. Collins went for 12 points, eight rebounds, four blocks and two assists in 22 minutes. Jusuf Nurkic put up a double-double of 11 points and 12 rebounds to go with five assists before fouling out in 22 minutes. The Pelicans, playing without Anthony Davis, Jrue Holiday, E'Twaun Moore and a host of others, were led by Julius Randle, who put up a career-high of 45 points on 20-of-34 shooting while also tallying 11 rebounds, six assists, three blocks and two steals in 42 minutes. Elfrid Payton put up his third-straight triple-double with 14 points, 16 assists and 12 rebounds in 41 minutes. Frank Jackson added 16 and Jahill Okafor scored 10 points in 12 minutes to round out New Orleans' double digit scorers. Next up, the Trail Blazers finish up a three-game trip with the second night of a back-to-back versus the Spurs in San Antonio. Tipoff is scheduled for 5:30 p.m.